Where I part company from my physio – hopefully for some time! I didn’t sleep much last night. 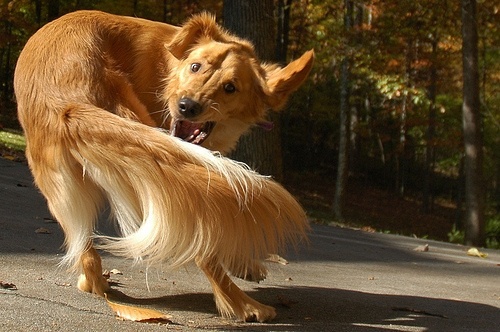 My mind was running round and round in circles (like a dog chasing it’s tail — you got it!). It wasn’t bad. I mean I wasn’t churning anxieties over or replaying conversations with what-ifs or thinking up belated clever ripostes. I was just too excited plain and simple. I saw my physio yesterday and the outcome of that was me feeling ready to get back to class. And this after 3 months of physio and general TLC for my hamstring. Did I mention I’m excited by this? I’m also amused by the irony that practice seems to teach me nothing at all. I can almost feel Patanjali pointing out the massive fluctuations going on in my mind stuff right now (to paraphrase PYS 1.2 , the one about the aim of yoga being the cessation of mental fluctuations). Yeah, I know I’m not supposed to be attached to my regular class or indeed practice of any sort, since it’s just a means to an end. I’m not supposed to feel pride in my physio’s acknowledgement of my self-discipline in getting this far without any major setback. I’m sure I’m not supposed to pass the quiet hours of the night doing asana practice in my head. Nor then to start anxiously second-guessing the difficulties I might face in this new phase of rehab/yoga. But I am feeling all this and truth be told I’m loving it! I can practically feel every cell of my body fizzing away with energy. Maybe it’s spring, maybe it’s my prana. But this is how it is right now. There’s time for concentration and focus later when I’m on the mat. Now there’s just joy. Will my mum give up yoga? Fantastic! Enjoy every moment for you really deserve to. Bravo! Maybe Patanjali would say that you are exactly where you should be right now: just basking in joy! “Attachment in full throttle” – exactly how it feels. I’m revving away!